What do you know about Bangla hasir koutuk ? That means bangla funny jokes which make you laugh. If you are looking for Bangla hasir koutuk , you are right page. 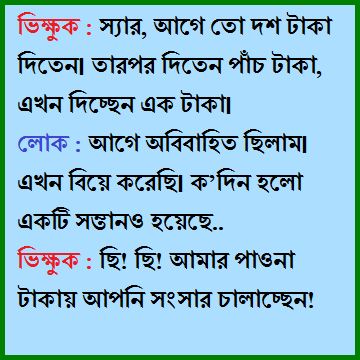 Here you will get many bangla funny jokes that make you laugh and your friends. Bangla jokes. You like to do fun with your friends or with your family. If you post bangla funny jokes on your facebook, than your all friends will see this and they get so much fun and joy. To make laugh someone this is the best way for all of us. You also can send these funny jokes to your friends mobile. 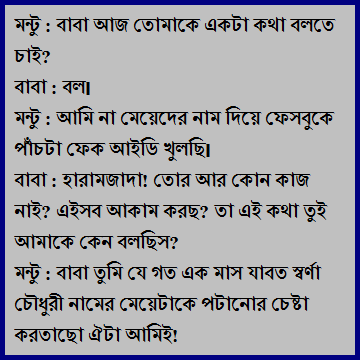 So lets see our bangla funny jokes collection. Boltu: Tui tor bouer sathe jogra koris ? Poltu: Hm, kori. tobe protibar jograr seshe O ese hatu gere amar samne bose pore. Boltu: Bolish ki ! tarpor ? Poltu: Tarpor matha jhukiye bole : – khater tola theke beriye eso, ar marbo na. বলটুঃ তুই তোর বউয়ের সাথে জগড়া করিস ? বলটুঃ বলিস কি, তার পর ? 1st frnd: janis amader basar sobai bathroom a gan gay. 2nd frnd: bolish ki , sobbai ? 1st frnd: sobbai, cakor bakor porjonto. 2nd frnd: Tora sobai tahole khub ganer vokto. 1st frnd: Dhur, ta noy, asole amader bathroomer chitkinita nosto, tai ! ২য় বন্ধুঃ বলিস কি, সবাই ? Vikkuk: mago ! duita vikka den ma ! Barir malik: Brite manush nei, jao ! Vikkuk: Apni jodi ek miniter jonno manush hon, tahole khub valo hoto ! chele: baba tumi naki ghush khao ? baba: shuna kothay kan dite nei. baba: tumi naki porikkhay fel korecho ? chele: tumi ki dekhecho baba ? chele: shuna kothay kan dite nei baba. Sokkhok: accha bolte paro dudher sathe biraler kon khane mil ache ? chatro: sir, etato khub sohoj proshno. chatro: sir, duto thekei chana pawa jay. Rogi: aj ami bujte parchi, samanno jor je koto voyaboho hote pare. Rogi: apnar bill er kagoj ta dekhe.